This country music superstar is on fire! 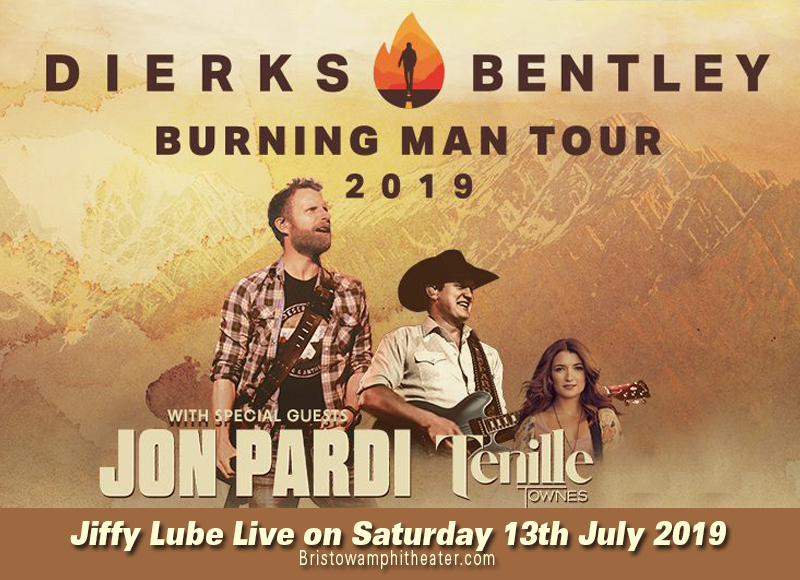 Dierks Bentley has just turned on the heat as dropped the word about his on-going tour dubbed as 'The Burning Man Tour'. Yes, this hottie is back on the road and is headed this way, to the Jiffy Lube Live on Saturday 13th July 2019. Sharing the stage with Bentley are two of county music's finest — Jon Pardi and Tenille Townes. This is one of the most hotly anticipated shows this year. Fans from all over town are burning the wires so as to get their hands on this red hot ticket. If you're feeling the heat, it's time for you to act and click to book tickets for yourself and for the whole gang. Don't miss it! Dierks Bentley is actually a cool dude with a hot career as one of country music's biggest superstars. He started heady and strong as his eponymous debut album and his sophomore release "Modern Day Drifter" are both certified platinum sellers. Along the ways, he snagged more best-sellers and gold records, with his latest and eighth studio album "The Mountain" released last June 2018. Bentley's studio albums has spawned a total of 25 chart-toppers, and 17 of which are certified number ones. "What Was I Thinkin'", "Come a Little Closer", "Settle for a Slowdown", "Every Mile a Memory", "Free and Easy (Down the Road I Go)", "Feel That Fire", "Sideways", "Am I the Only One", "Home", "5-1-5-0", "I Hold On", "Drunk on a Plane", "Say You Do", "Somewhere on a Beach", "Different for Girls", "Woman, Amen" and "Burning Man". Six more of his singles have reached the top 5. Bentley is also a recipient of the CMA Horizon Award (now known as Best New Artist award) and was invited to be inducted into the Grand Ole Opry. Dierks Bentley often mounts his live concerts with a tour buddy. For him, this is as crucial as all the other elements to pull off a concert tour. Not one, not two, but three country music stars sharing the stage in one amusing night —definitely not worth missing for the world! Be there!